Our market fresh fish is a real treat. As you know, with our traditional service, one of our friendly drivers delivers the fish to your door and you have the flexibility to portion the fish just as you like it and cook some up the same day. If you run out we have courier deliveries every Tuesday, Wednesday, Thursday and Friday, free for orders over £75. When you were young, you probably had a relative tell you that if you wanted to do well in school, you should eat lots of fish. Fish, they went on, is good for the brain. You probably believed it at the time (as children are wont to do), but dismissed it as an old wives’ tale when you got older. Well, as it happens, your younger self was right to believe it. Studies into the health benefits of fish are proving that not only is it indeed very good for the brain – but also for your heart, your skin, your joints, your lungs, your eyes…the list goes on. 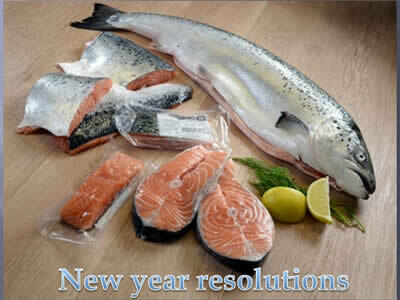 Here are just a few of the many ways in which eating fish can make you the very image of good health. The benefits of oily sea fish were first suspected when it was observed that the Inuit – whose diet primarily consists of seafood – were observed to have much lower rates of cardiovascular disease than members of other cultures. While recent research has dismissed claims that Omega 3 fatty acids in fish directly benefit the heart, scientists nonetheless point out that consumption of fish can help to lower your blood pressure, and clean out your blood vessels. All of which is, of course, excellent news for your cardiovascular system. Due to fishing quotas and continued wrangling over European fishery regulations, the price of fish is often seen as an issue. However, if you are a bit financially savvy with your shopping, or buy direct from us, then fish can actually replace meats like poultry and beef with a minimum of damage to your wallet! After all, who can put a price on a healthy heart? Just like granny told you, eating oily fish really can improve your brain – if you broil or bake it, that is. This is because the effect is, once again, down to those Omega 3 fatty acids – which are often destroyed during the frying process. Studies undertaken over decades on various individuals have determined that those who regularly eat broiled or baked fish have more grey matter in their brains to a later age than those who do not. In effect, this means that their brains are performing at a higher level for longer. Fish-eaters were also more likely to have achieved highly in school, and to have gone on to get a college education. These findings were borne out by a study here in the UK, which saw school children given Omega 3 supplements concentrating for longer and performing better in school than they had done previously. Scientists theorise that Omega 3 fatty acids may make it easier for synapses within the brain to signal each other, which not only makes the thinking process faster and more efficient, it also keeps the brain-cells active and nourished, meaning that they are less likel to stagnate and die off. As well as being rich in essential fatty acids like Omega 3, fish is also packed full of protein, Vitamin D, selenium, and many other vital nutrients. It’s also exceedingly low in saturated fat. Vitamin D in particular is something that we in Britain really need to get us through the cloudy days and the dark winter. Vitamin D is a nutrient that is also obtained through the skin when we are exposed to sunlight – and as such it’s a nutrient that we really, really need. Humans evolved in much sunnier climes than Britain, and our bodies find it hard to cope without much Vitamin D. Traditionally, communities as far north as Britain survived by eating a diet high in fish, which is itself high in Vitamin D. It is only relatively recently that fish has started to lose its pole position in the Western diet – and we’re suffering the consequences. Vitamin D is essential for the formation of strong bones, and it is a major aid to the immune system. It also plays a crucial role in regulating our moods. Lack of Vitamin D is why so many people get miserable and even more get sick during the darkness of winter. Some people buy expensive sunlight lamps to help them get their Vitamin D fix – but it’s far cheaper (and much tastier!) to top up your D levels by eating fish! News on the Global Prawn crisis…Unfortunately the global supply of coldwater prawns is currently at a critically low level, this is a unique situation and one that is industry wide affecting all suppliers. Regal Fish are committed to customer satisfaction and so we are working hard with the help of our supplier to get the best market price for our customer but in the meantime it is with regre…t that we will have to further increase the price of our Regal Superior Prawns. Please be assured that our supplier is actively looking to acquire stock and as soon as they do we will let our customers know and any savings will be passed on to our valued customers. We realise the desire for coldwater prawns, particularly coming up to Christmas and as usual we will have special offers on the usual festive favourites. These will come on sale next week so keep an eye out for the discounted packs. We will keep you informed of the global situation as it develops. Some of the usual faces are missing as they decided to sneak off for their breakfast when we arrived with the camera! It’s possibly for the best, Monday mornings aren’t great anyway and especially not if you have a 4am alarm!! Orders all ready and packed waiting for our drivers to load them into their vehicles and take them directly to our customers homes. 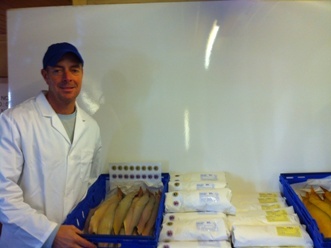 Fresh fish filleted and delivered in a matter of hours. If you want to know what sets our Smoked fish apart from any other. Take a look a this article, an interesting look at the history of fish smoking in Grimsby and how the PGI status on Traditional Grimsby Smoked Fish has raised the profile on this age old method and put Grimsby back on the map! Fortunately for our customers it means that we can have Freshly caught fish, filleted and smoked one day and in your home the next. Can’t get much fresher smoked fish than that! Have a look at the smoking methods used for our Traditional Smoked Fish from Grimsby. Some fascinating information and an insight into the history of smoking fish in Grimsby and what the PGI status means. 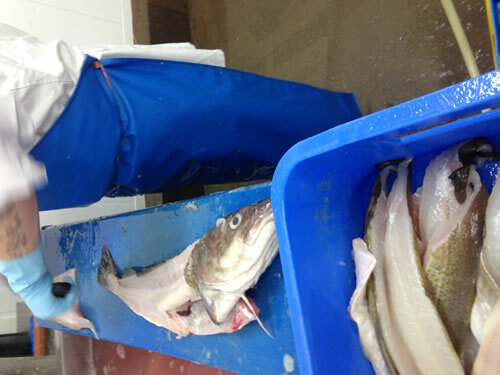 Your Haddock this week has been caught by the Venturous and landed at the Port of Cullivoe in the Shetland Islands. Take a look at where the fish was caught here.